One of the big reasons I bought this book was because I heard this was raising money for charity, in which a portion of the proceeds go towards the Wildlife Conservation Society. 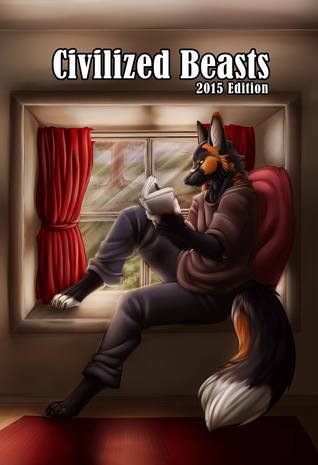 Another big reason is because this is only the second furry poetry collection I've heard of, and I wish there were more of its kind available. Despite all the poems primarily using an animal as an image, I never felt like I was reading the same style of poetry over and over. This offers a wide variety of free verse poems, poems with a rhyme scheme, short ones, long ones, a few that were very visual with the formatting (in which the text formed a simple image), and I found one that had a similar structure to a sonnet. I enjoyed a lot of the themes in the poems, especially those which expressed, or at times, praised, nature's beauty. There were a couple where, I admit, I geeked out a little on because they primarily focused on the Biology of what the poet's "gimmmick" is for their piece. It's wonderful to see any scientific themes integrated into something as down-to-earth and artistic as poetry; it shows how creative people can get and that two seemingly opposite subjects don't necessarily need to stay separate.Overall, this was an interesting collection. From poems that provoke deep thought, to ones that brings out nature's beauty, you're bound to find a few poems that tickle your fancy; I know I sure did. I have a poem in this collection! And I'm glad I have. The poems here span a broad range of styles and subjects, from the animals in the wild and in our homes to the animals in us. It's full of funny, moving, thought-provoking and beautiful images, and a nicely printed and laid out volume too.